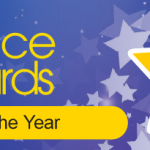 Kids at Home has been named Australia’s best Family Day Care Service in the 2017 Excellence in Family Day Care Awards held in Sydney. “The service demonstrates a strong engagement with the National Quality Framework and the highest of standards in educator practice; educator support and business management,” said Family Day Care Australia Chief Executive Officer, Andrew Paterson. 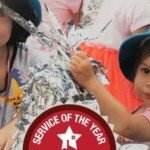 Despite being one of the largest services in Queensland, Kids at Home Family Day Care attribute part of their success to being able to retain a small service feel with a tight and positive team. 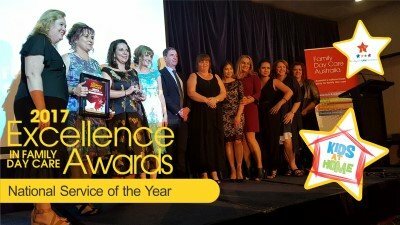 Mr Paterson said, “With such high quality services named as national finalists, choosing a winner an extremely difficult decision, but Kids at Home Family Day Care are certainly very deserving winners,” he said. 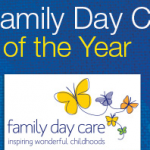 We are naturally delighted to be recognised for our passion and dedication to Family Day Care, and thank all of our staff, Educators, families and children who have all played their part in making Kids at Home the best Family Day Care Service in Australia! Kids at Home Family Day Care is approved by the Queensland Government Office for Early Childhood Education and Care, the QLD and NSW Department of Education, Training and Employment, and also by the Australian Government Department of Education, (DOE), and is a member of the Australian Family Day Care Association and the Family Day Care Association of Queensland.